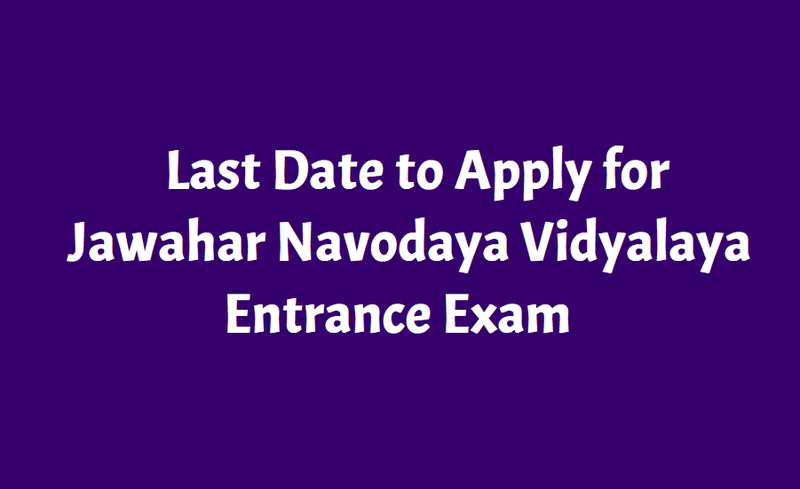 How to apply for Jawahar Navodaya Vidyalaya Admission 2019 Application deadline is December 15: Jawahar Navodaya Vidyalaya Entrance Exam 2019 Online Application form submission last date extended. The Last date for the registration process of the Jawahar Navodaya Vidyalaya JNV Selection Test for Class VI admission has been extended to December 15. Earlier, the last date to apply for the test was November 30. The registration window opened on November 1 and November 30, 2018, and now the last date to submit the online application form is December 15. Navodaya Admissions 2019: Jawahar Navodaya Vidyalaya will soon end the online application process of the Class 6 admissions. According to the official notification on the website, the date has been extended and now the admissions will be closed on December 15, 2018. Candidates could fill the online applications till November 30, 2018, according to the previous report but now they can apply for Navodaya admissions for Class 6 by December 15. The selection test will be conducted on Saturday, April 6, 2019, at 11:15 am in one phase for all Jawahar Navodaya Vidyalayas. a. Last date of Navodaya registration for Class 6 admission is December 15, 2018.
b. Navodaya Selection test for Class 6 will be conducted on April 6, 2019.
and more details are available at the official site of Navodaya Vidyalaya Samiti. JNV Admission 2019 registration process for class 6 admission in Jawahar Navodaya Vidyalaya (JNV) has been extended till December 15. On the other hand, November 30 was the last day to apply for class 9 admission in JNVs. Online registration for admission can be done now. Students who are studying Class V during the Academic Session 2018-19 in one of the government/ government recognized schools of the district where the JNV is functioning and where admission is sought, are eligible to apply. Selection test for admission to Class VI will be conducted on Saturday, the April 6, 2019 in Jawahar Navodaya Vidyalaya of concerned district/ any other centre allotted by NVS. For class 6 admission, students will be enrolled on the basis of their performance in Jawahar Navodaya Vidyalaya Selection Test (JNVST) 2019 which is scheduled to be held on April 6. Last year 28 lakh students had appeared for the exam. The candidates can submit their application forms online through the official website of JNV - navodaya.gov.in. Students have to enter the login credentials that include username/registration, password and captcha code. Submit the personal details and upload the scanned copy of the documents and submit. Candidates can check the official site of Navodaya Vidyalaya Samiti to know more about the admission process. The JNV Selection Test 2019 for class sixth admission would be conducted on April 6, 2019, at various Jawahar Navodaya Vidyalayas across India. The Navodaya Admit Cards for Class VI entrance test would be made available on the official website from March 1, 2019, onward, till the exam date. The selected students will also be informed through SMS on their registered number followed by a speed post. The application process includes two stages. Stage one requires online registration followed by submission of personal details. Personal details include uploading images. Scanned copy of the signature of the ward and parents along with an image of the candidate and relevant certificates. STEP Two: Submission of Personal Details (including uploading of Images). d. Class V certificate (Size:10-100 KB in .JPG/.jpg format) ready before filling up personal details. Note:If all the steps are not completed,then your candidature will not be considered. Step 7: Fill in the required detail including the scanned copy of certificates. Note: To complete both steps of application, one also has to verify their documents. Those who do not fulfil both the steps might be disqualified, according to the official release. For more details, interested people can visit the official website: navodya.govin.